Cross-metathesis (CM), a carbon-carbon bond transformation that features exceptional selectivity, reactivity and tolerance to functionalities, has been extensively investigated in organic chemistry. On the other hand, the use of CM in polymer synthesis is also growing in both scope and breadth, thus offering a wealth of opportunities for introducing a vast range of functionalities into polymer backbone so as to manipulate properties and expand applications. 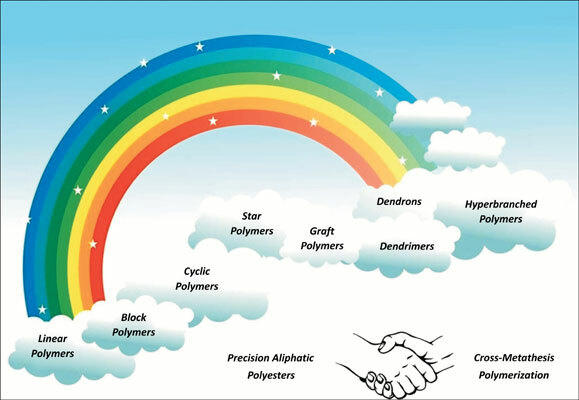 In this review, we propose the concept of “cross-metathesis polymerization” (CMP) referring to polymer synthesis via repetitive CM reaction and summarize emerging strategies for the precision synthesis of aliphatic polyesters via CMP based on the high CM tendency between acrylates and α- olefins. Due to the carbon-carbon bond-forming step-growth polymerization nature, CMP brings a new concept to polyester synthesis. This remarkable polymerization method possesses unique advantages such as mild condition, full conversion, fast kinetics, almost quantitative yield and extraordinary tolerance to functionalities. In particular, CMP provides the ability to regulate macromolecular architectures including linear, block, cyclic, star, graft, dendron, hyperbranched and dendrimer topologies. Ultimately, advanced polymeric materials with outstanding performances can be facially constructed based on these sophisticated macromolecular architectures. Cross-metathesis polymerization (CMP), aliphatic polyester, precision synthesis, topology control, olefin metathesis (OM), crossmetathesis (CM).